The Model 8502A Digital multimeter is a 6 1/2 digit instrument employing microprocessor control and a bus structure. Memory programming either from the front panel or through a remote Interface permits a number of operations to be performed on the measured input before it is displayed. The standard configuration allows for measurement of dc volts in 5 ranges. Four ranges are available for ac volts when either optional ac Converter is installed. Resistance can be measured in 8 ranges. Current can be measured in 5 ranges. Modular Construction Considerable versatility is realized through the 8502A’s unique construction. All active components are contained in modules which plug into a mainframe motherboard. This module-motherboard mating, combined with bus architecture and microprocessor control, yields both ease of option selection and reduced downtime. Microprocessor Control All modules function under direct control of a microprocessor based controller. Each module is addressed by the controller as a memory location. External reference values and offsets can be applied separately, stored in memory, and automatically used as factors in all subsequent readings. Digital filtering utilizes averaged samples for each reading. Recirculating Remainder A/D Conversion The 8502A adapts Fluke’s patented recirculating remainder (R2) A/D conversion technique to microprocessor control. This combination provides fast, accurate, linear measurements and long-term stability. This manual comprises eight modular sections. 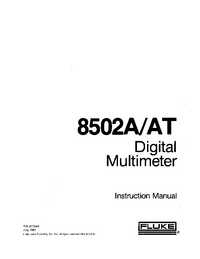 You will find herein up-to-date information for installing, operating and maintaining the Fluke Model 8502A Digital multimeter. Generally, complete descriptions and instructions are provided for the 8502A mainframe, modules necessary for DC Volts and DC Ratio measurement, and for any optional modules (AC Converter, Ohms Converter, etc.) that you may have ordered with your 8502A. Specifically, each section contains: 1. 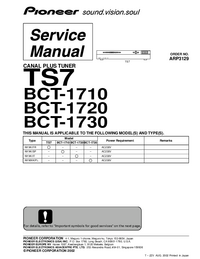 Section 1 — General description, specifications. 2. Section 2 — Operating instruction, capabilities. 3. Section 3 — Theory of operation, including simplified schematic and functional block diagrams. 4. Section 4 — Maintenance, adjustments and troubleshooting. 5. Section 5 — List of replaceable parts, with parts locators. 6. 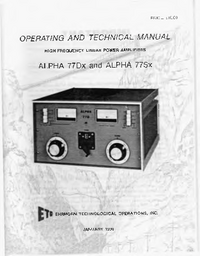 Section 6 — Option and accessory information, including complete information on any option ordered with the 8502A. As the need arises to broaden your8502A’s capabilities, the most recent information will be included with any options you order. 7. Section 7 — General information (list of abbreviations, federal supply codes, Service Centers, and Sales Respresentatives). 8. Section 8 - Schematic diagrams. 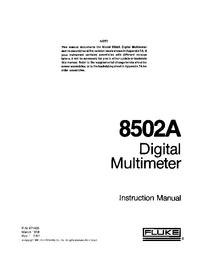 This addendum modifies the standard 8502A Instruction Manual to cover operations and servicing of the 8502A/AT Digital Multimeter. 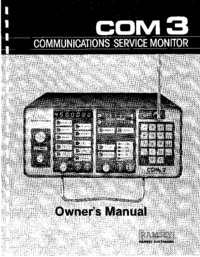 If no reference is made to a numbered paragraph, figure, or table, that item in the 8502A manual remains correct, except for the change in nomenclature.